Liberia's Ebola Routine: Wear Your Temperature On Your Lapel : Goats and Soda NPR producer Nicole Beemsterboer reflects on 10 days in Liberia: children losing parents, young men risking their lives to collect bodies, and the smell of chlorinated hand-washing water everywhere. 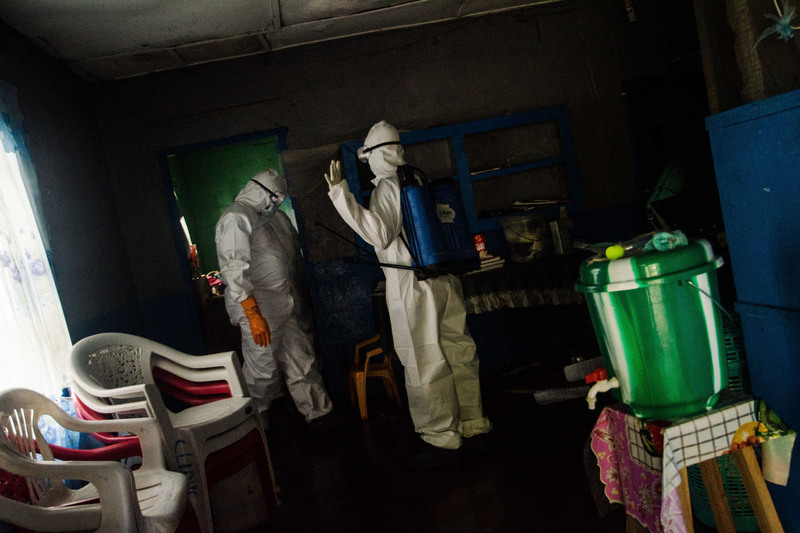 Body collectors come to the home of four children in Monrovia who lost both parents to Ebola. After 10 days in Liberia, NPR producer Nicole Beemsterboer has just landed in London. "You don't realize how much has been hanging over your head until you're out," she says. She's talking about Ebola, the virus raging in Liberia as well as Sierra Leone and Guinea. "It was silent and invisible," she says. "So you're always on edge, always careful." I got used to not touching anyone, no handshakes. And there are buckets of chlorine solution everywhere — outside every office building, police station, government office, hotel, store. Everywhere. I washed my hands dozens of times a day, and was careful never to touch my face. At government buildings, officials watch you wash your hands and then take your temperature with an ear-gun thermometer. They write your temperature on a piece of paper and actually staple it to your lapel so it's visible to everyone inside. You can't get in the building if you have a temperature, and it sends a message: We're being vigilant; you need to be vigilant, too. Hold yourself and others accountable. And you were careful right down to the soles of your boots? We were concerned that if anything was contaminated, it was the bottom of our boots, so we were constantly rinsing them in the chlorine solution. I don't know that we started a trend, but on the last day we were there, our hotel added a shoe wash — a box with a big foam pad inside, soaked in chlorine so you didn't have to soak your shoes but were getting enough chlorine on [the soles] to decontaminate them. We started seeing this more and more, at Redemption Hospital and other places around the city. Does the chlorine cause any problems? Only minor ones, and under the threat of Ebola, they didn't bother me at all. All my clothes are spattered with bleach. I would dry my hands on my pants; my pants have bleach stains all over them. And it did smell like a pool everywhere you went. Headlines emphasize how hard it is to keep up with the outbreak. For people in Monrovia, if they do show symptoms, there are still limited options for where they can go. The MSF (Doctors Without Borders) facility is expanding, but as soon as they have more beds, they are immediately filled. There simply isn't enough room for all the people who are sick, and until there are, people who get sick will stay home, get sicker and put those around them at risk. You were part of the team that did a very moving story on body collectors. These young guys started this job because it paid well, and now they are complete converts to the fact that Ebola is real and that it is putting people at risk. They know if the contaminated bodies aren't removed, they put other people at extreme risk, and they are trying to spread the word. It's become a passion for them. And you saw the reaction of four children who'd just lost both parents to the disease. These kids — the youngest is 15, the oldest 22 — looked so alone and heartbroken and you could see they had no idea what they were going to do next. Instead of anyone comforting them, there were people from the body collector team saying, "If any of you touched your mom, you need to go right now to be tested for Ebola." It was as if they were being sentenced to death. Any new twists to the way airports are screening people? When we landed in Casablanca, instead of someone taking your temperature with the ear gun, they had us stand about 20 feet away from a staff person in nurses scrubs in front of an infrared camera. If anyone does have a fever, the airport staff doesn't have to be anywhere near you.